After many attempted phone calls I have decided to take our issues to a public forum. Three weeks ago our 2015 Dodge Ram broke down outside of Thunder Bay Ontario. After 6 days the service department at the Thunder Bay dodge claimed to have our truck fixed, said it was a frayed wire which they soldered as a fix. It took 8 hours to do this repair and a lot of our money. We attempted to leave town the next day and continue our journey back to Alberta but as soon as we hit the road the truck lost power and the engine light came back on and the issue we had initially wasnt fixed. So we drove straight back to the dealer in Thunder Bay and then they proceeded to tell us it was the fuel filters that were causing the problem and changed them out for us. Well big surprise that wasnt the issue, although they made sure to charge us for it. The truck still had the same issue so they then decided it was our fuel pump that needed to be changed out. So we waited another 5 days for the fuel pump to be changed. Finally 11 days after we first broke down we hit the road again. After traveling 3 hours the engine light came on and the truck lost power once again. Luckily we were not far from Dryden ON and were able to have the truck towed to the dodge dealer there. They looked at it and said it was now the power distribution centre which needed to be changed out. We called Chrysler Canada on Aug 31st to have them rush the part here, as we are desperate to get home. They assured us it would be done and we could expect the part on Tuesday (sept 4th). The 4th rolled around and they said it wouldnt be in until the 6th, which turned into the 7th, which turned into the 8th (today). When we contacted dodge here in Dryden today they said it wouldnt be in until the 14th and that the part hasnt even been sent out yet!! This experience has been beyond frustrating, we are a family with two small children, we have jobs and a life to get back to. We have been waiting three weeks now and by the time the 14th rolls around it will be 4weeks. We have called the Chrysler Canada (FCA) several times to voice our complaints but they show no sympathy and offer no help other then suggesting we continue to wait. I would expect more from a major company, I would expect someone to at the least say we are sorry this has happened to you, what can we do to help you. But that must not be a company policy. Customer retention and service isnt a priority. Not only have we paid a huge amount of money to have the truck repaired (none of which have actually repair it at all), we have also spent much of our savings on tow trucks, vehicle rentals, taxi rides and camping fees, which we are most likely not to be reimbursed for. So congratulations dodge you have lost some very loyal customers. Came and took a look at a new jeep wrangler with my mother as a possible replacement for her older VW, we were from out of town and looking more for comparison sake at that time. We found the salesmen to be a bit lacking in his actual knowledge of the vehicle I.e how to properly remove the freedom top and where all the controls were located but he was friendly enough and not overly pushy. We were impressed with the sales manager who introduced himself upon our return and was very professional. He appreciated the fact that we were from out of town on a tight schedule and he stated that if we decided we wanted to purchase he would work out the best price he could possibly give us with no haggling needed I appreciated the way they did business and in the end my mother decided that it was not the vehicle for her and they respected that decision with only a single follow up and afterwards no annoying repeat calls like some places. 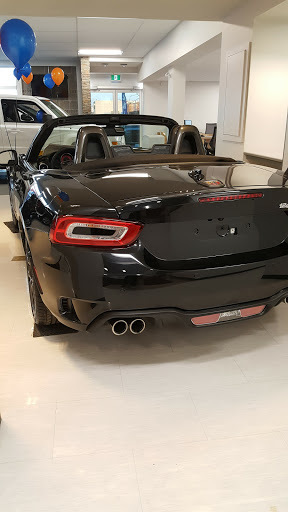 If you are looking for a Chrysler dodge jeep in the thunder bay area I would definitely pay them a visit. I had just lost my job in Alberta and was travelling home back to the Maritimes and of course the weather was not at all the best, while travelling through Ontario my windshield wipers decided to stop working and driving in these conditions were dangerous at best. I was directed to Lakehead Dodge and met with Grant Wilkie, he heard what was wrong and although there were no openings, he told me to leave the truck and they will look at it. Not only did they look at it, they told me what was wrong, did not put parts in that were not necessary and told me how to fix the problem should it occur again. He then tells me they are not going to charge me for their time, what can I say, it was just what I needed to hear, they treated me with respect and did not take advantage of the situation, I seriously could not drive on without wipers. Upmost respect for Grant and his Service Dept. Thank you. Access to the service department was really poor. Each time I phoned all the lines were busy and I wasnt allowed to hold until one was free. I was, however, forced to listen to some promotional nonsense beforehand where some clown with the most obnoxious voice one could possibly imagine was over-selling vehicles and parts that I will never, ever buy. If anyone from Lakehead motors ends up reading this, just know that this moron’s voice isn’t instilling a desire to purchase car parts in me, but rather an irrational hatred for my fellow human beings that I can’t recall ever feeling before. I now look forward to the part of the service process where Im overcharged for minor repair work that will likely be performed improperly and require parts that aren’t in stock. With practices like these, it’s no wonder that domestic car companies are slowly going out of business.